This is the patient person’s crime thriller. It’s slow, deliberate, measured, fragmented in its approach. Characters emerge from the shadows, surrounded by silences. Everything starts in a reflection. The film takes its time to set the mood, engage the audience, put the plot in motion. Scenes are brutal, grizzly, bloody. The language is tough. A sense of repressed evil pervades everything. Bob (Tom Hardy) narrates when he needs to. In the beginning, he talks about money; dirty money moves around the city every night, ending up in the “drop boxes” of various bars where it’s picked up in the morning. In the end, he talks about the devil; the devil is just waiting for your body to quit because he already owns your soul. Bob works for his cousin Marv (James Gandolfini) at a bar Marv used to own before the Chechen thugs pressed him and he blinked. Now Marv is just trying to get back into the game. Bob’s wondering if Marv is planning something desperate, something they can’t clean up this time. There will be an armed robbery and a severed arm. People will be rubbed out; responsibilities will be passed on. There’s an inevitable “circle of life” feeling to it all. The characters are limited – in number and capability. It’s difficult to tell if they’re simmering or just not very bright. The camera stays in tight, forcing us to wonder what’s hidden in the corners of every scene. The suspense builds, dissipates, and builds again. 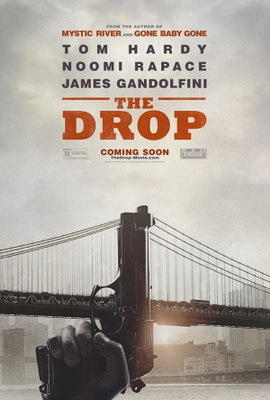 Hardy, Gandolfini and Noomi Rapace are terrific. The script is sometimes choppy but fear and a sense of coldness become strong characters in the story. As we move towards the season of serious movies, this is a seriously good entry point. For those with patience.